The history of early music is largely nameless, but two faces peer out at us from a cathedral in 12th / 13th century Paris. We know little about the working lives of Leonin (1159–1201) and Perotin (1170–1236) but we owe much of what we do have to the mysterious Anonymous IV, the name attributed to an English student who studied or worked at Notre Dame in the late 13th century. It’s Anonymous IV who, in his manuscript on medieval music, writes of the Notre Dame School of composition and singles out Leonin and Perotin as the two leading musical figures in the first decades of the cathedral’s history. We can assume that there were still others; but in naming two of them, that nameless writer gives shape to the stone. Anonymous IV tells us that Leonin first compiled the Magnus liber organi – the Great Book of Organum – which contained written notation for chant settings that accompanied events of the liturgical year. In Leonin’s music, we find some of the earliest examples of polyphonic writing: music for two voices (“voices” here referring to the number of distinct vocal parts, not to the number of singers proper). 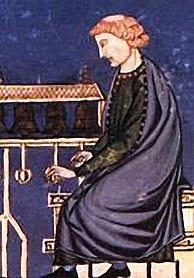 In essence, Leonin slowed down the plainchant of the Gregorian tradition to create a drone-like foundation, above which he could position a wandering melodic line. This new layering of vocal parts was known as organum duplum or two-part polyphony. You can listen to Leonin’s impressive Videnrunt omnes here (sung by Tonus Peregrinus). Perotin elaborated on Leonin’s creative impulse and wrote music for three, even four, voices. Anonymous IV points to two instances of Perotin’s organum quadruplum – Sederunt principes and Viderunt omnes – in which the rhythmic swirling and interweaving of vocal parts make for a strikingly original sound-world. Experience Sederunt principes, yet another window into the medieval imagination, as performed by The Hilliard Ensemble. It was first performed in dedication to a new wing of Notre Dame Cathedral in 1199. New sound to fill new space. Prior to these developments, liturgical chant remained relatively static, transmitted orally and, in accordance with Catholic Church decree, unchanged. (I am reminded of brother Jorge’s regretful insistence, in The Name of the Rose, that there can be no development in human knowledge and art, but only “a continuous and sublime recapitulation.”*) In Leonin and Perotin, plainchant remained theologically tethered to the Church, but was increasingly musically freed through polyphonic exploration. In some sense, there’s a slow reaching out by the artist for relative creative freedom, if still willingly swallowed up by an anonymous, devotional whole. Like Notre Dame’s vaulted ceilings, Leonin and Perotin help us to map out some semblance of the medieval imagination, which sought at once to mirror the orders of the cosmos and to point beyond the fabric of the material world. It is a foreign land, perhaps, but it’s hard to feel like a tourist when listening. Reconciling the beauty of medieval art with the dark dance of dogma, with bloodied stones since washed clean, remains an impossible calculus. Still, it’s quite possible that in these works of the medieval mind we are able to hear distant relatives of ourselves. It’s certainly true that, thanks to Anonymous IV, we’re able to name at least two of them. *Quote taken from Umberto Eco, The Name of the Rose (Harcourt, 1983). **Photograph, “Interior of Notre-Dame,” © Declan McCullagh. You can visit his website here. Leonin / Perotin: Sacred Music from Notre Dame Cathedral (Tonus Peregrinus; Naxos 8.557340, 2005). Perotin (The Hilliard Ensemble; ECM New Series 1385, 1988).